Second-order RLC circuits have a resistor, inductor, and capacitor connected serially or in parallel. To analyze a second-order parallel circuit, you follow the same process for analyzing an RLC series circuit. Here is an example RLC parallel circuit. The left diagram shows an input iN with initial inductor current I0 and capacitor voltage V0. The top-right diagram shows the input current source iN set equal to zero, which lets you solve for the zero-input response. The bottom-right diagram shows the initial conditions (I0 and V0) set equal to zero, which lets you obtain the zero-state response. With duality, you substitute every electrical term in an equation with its dual, or counterpart, and get another correct equation. For example, voltage and current are dual variables. The current iL(t) is the inductor current, and L is the inductance. 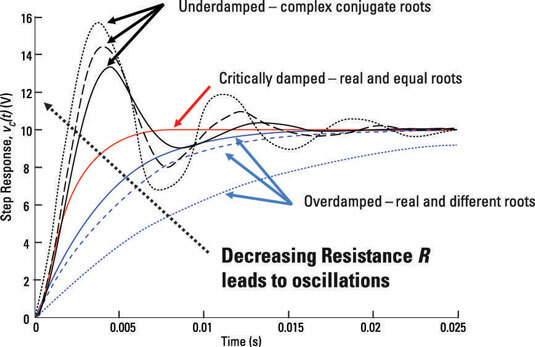 This constraint means a changing current generates an inductor voltage. If the inductor current doesn’t change, there’s no inductor voltage, implying a short circuit. 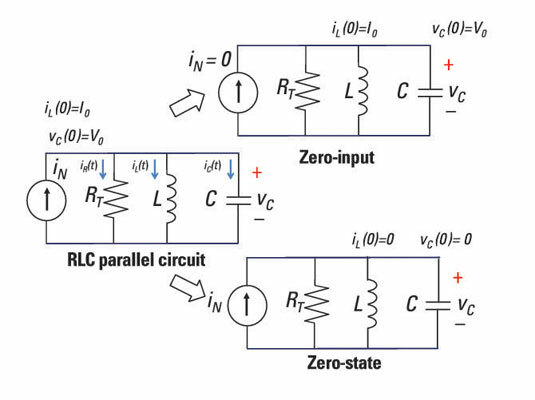 The RLC parallel circuit is described by a second-order differential equation, so the circuit is a second-order circuit. The unknown is the inductor current iL(t). The two differential equations have the same form. The unknown solution for the parallel RLC circuit is the inductor current, and the unknown for the series RLC circuit is the capacitor voltage. These unknowns are dual variables. With duality, you can replace every electrical term in an equation with its dual and get another correct equation. If you use the following substitution of variables in the differential equation for the RLC series circuit, you get the differential equation for the RLC parallel circuit. Duality allows you to simplify your analysis when you know prior results. Yippee! 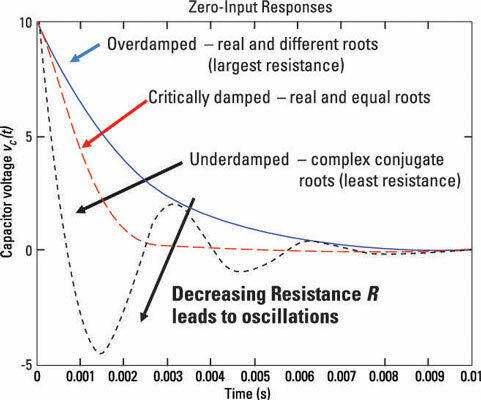 The zero-input responses of the inductor responses resemble the form shown here, which describes the capacitor voltage. After you plug in the dual variables, finding the constants c1 and c2 is easy. Zero-state response means zero initial conditions. You need to find the homogeneous and particular solutions of the inductor current when there’s an input source iN(t). Zero initial conditions means looking at the circuit when there’s 0 inductor current and 0 capacitor voltage. The solution resembles the results for the RLC series circuit. Also, the step responses of the inductor current follow the same form as the ones shown in the step responses found in this sample circuit, for the capacitor voltage.